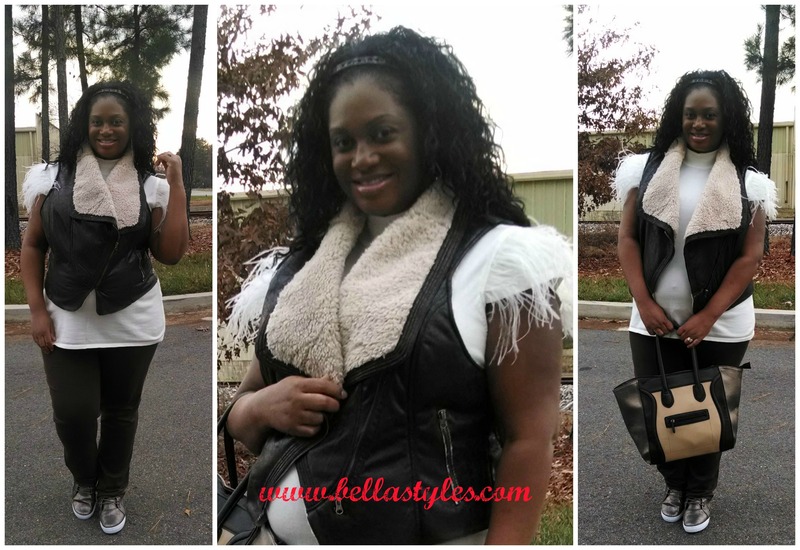 In what seems like forever since doing an outfit post, I just had to share my new found comfy chic find. Now as you know I’m about to pop very, very soon so finding comfy everyday wear is at the top of my list. Well even though today’s post isn’t inclusive of actual maternity clothing I wanna showcase how to take your regular clothes and make them work for a growing body type. The PR ladies over at Ashley Stewart were gracious enough to offer me some of the fantastic, stylish items from the new Fall/Winter 2014 Collection and here’s what I chose. 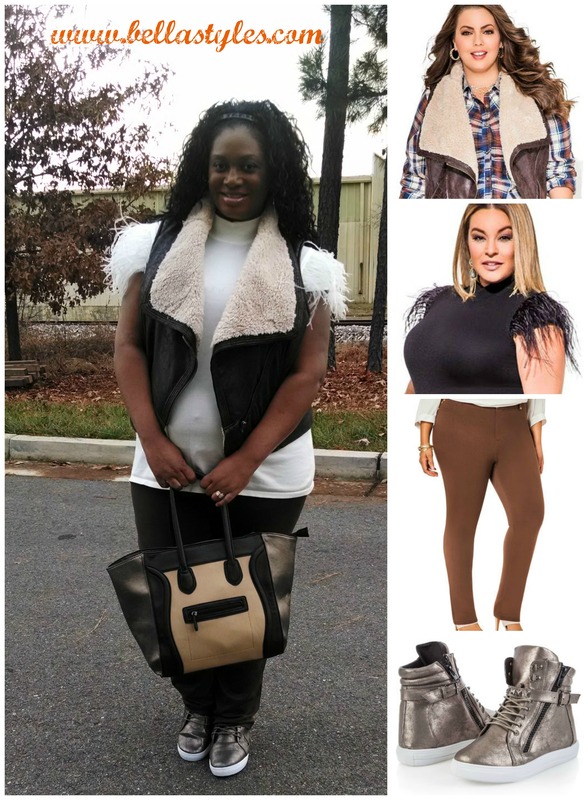 Today I went with sort of a ‘cowgirl’ look and wore the feather sleeve mock neck sweater along with the faux shearling vest. It was supposed to be a 65 degree day here in VA so I thought the short sleeves would be appropriate, (but the meteorologist was a little off with his weather prediction). They both fit great and I ordered a size up in the sweater to allow for my ‘bump’. (Check out the large belly button I have now, lol). So being that I was comfy up top I had to keep the flow going on the bottom portion as well. Let me tell you, these ponte skinny pants are the absolute best. They can be dressed up with heels or worn more laid back with these high-top sneakers such as I did. I also ordered a size up in the pants thinking that I would need the extra room but they fit true to size and I could have ordered my regular sizing. The stretch material felt and worked out great for my full day’s worth of errand running. Not to mention that I had been needing a nice pair of sneakers the whole 9 months and thanks to Ashley Stewart, I have found a pair that feel great on my feet all day long. P.S. The sneakers are wide-width so I was able to go a size down in them as well and being that they have zippers on the side they are a Mom-to-Be’s dream! Thanks so much and same to you Ms. Dee! You look cute Mama! I sure which I had zip up shoes during my pregnancy! Congratulations on the babe!